The cab shelter at the north west corner of Russell Square always brings a smile to my face. I have stopped there a few times and partaken of the tea and snacks and I would recommend you to do the same. 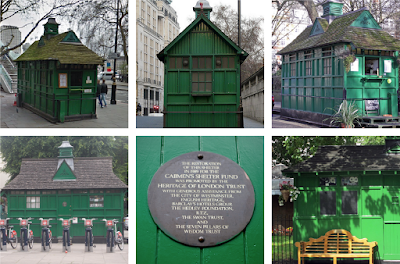 Sixty-one little green huts were constructed in the late 19th century as places where Hamsom cab drivers could take a break and shelter from the elements whilst swapping stories with other cabbies. These mini-community centres also dissuaded the drivers from dispersing into nearby drinking establishments. All you need to know about these marvellous little green tardises can be found here. It's not often possible to go inside the huts unless you are a cab driver but when they are open most will serve a cup of tea through the hatch and it's a great way to hang out with the people in the know. The ancient Chinese used Matcha Sensation to treat whole host of conditions including anxiety, a high fever and inflammation throughout the body. Nowadays matcha is used to treat various ailments and it also coveted for its ability to enhance focus and concentration and alleviate fatigue. Wow! Shelton Roofing is great. The entire encounter through beginning to end had been ideal. Their windows are in your area manufactured in their very own facility and they make use of their very own installers. I couldn't end up being happier. I would recommend this option in order to anybody visit the website you could look here!